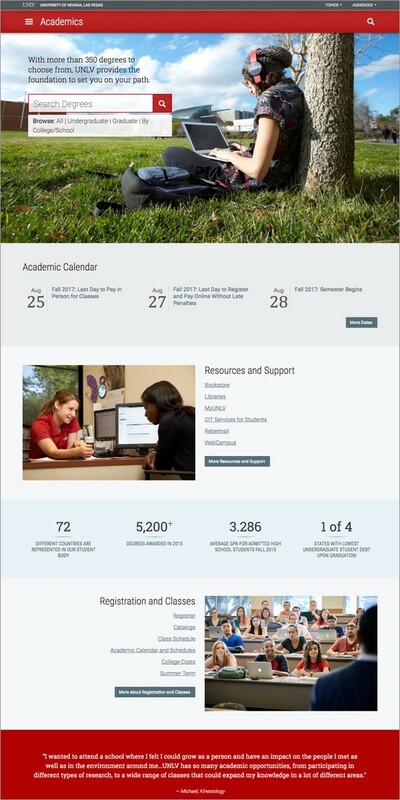 With an end goal of eventually updating the entire Rollins website, my team and I have decided to first focus on the area of academics. 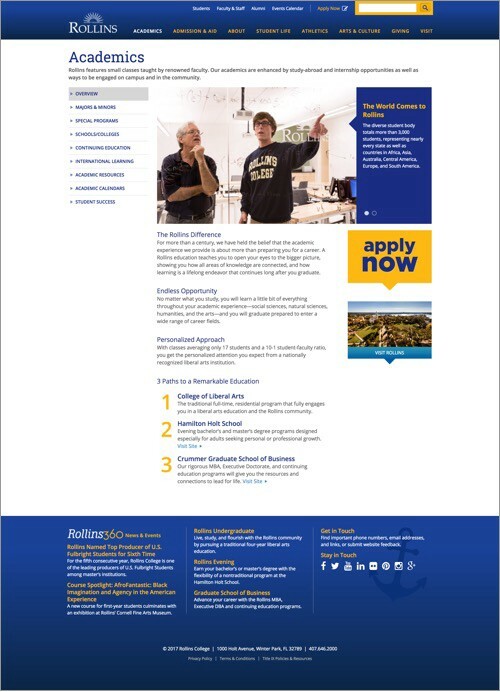 This decision is based on our assumption that our primary users — potential Rollins students — are most interested in the areas of study offered at the college and what courses are needed. How are these pages currently performing and are site visitors finding what they need? 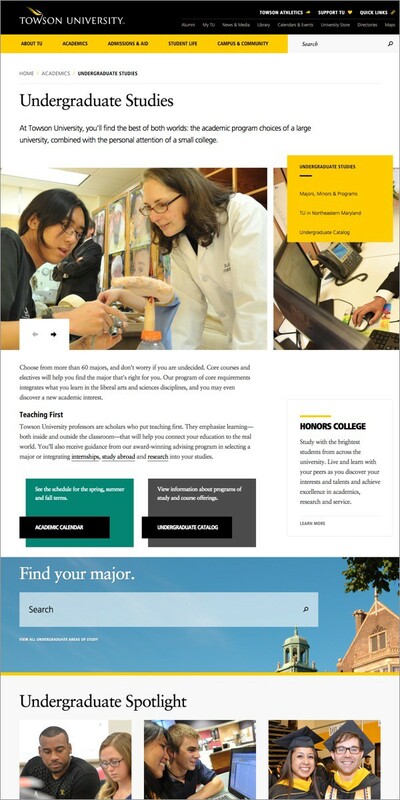 Does the information pertaining to the school’s various degree programs need to be more clear? 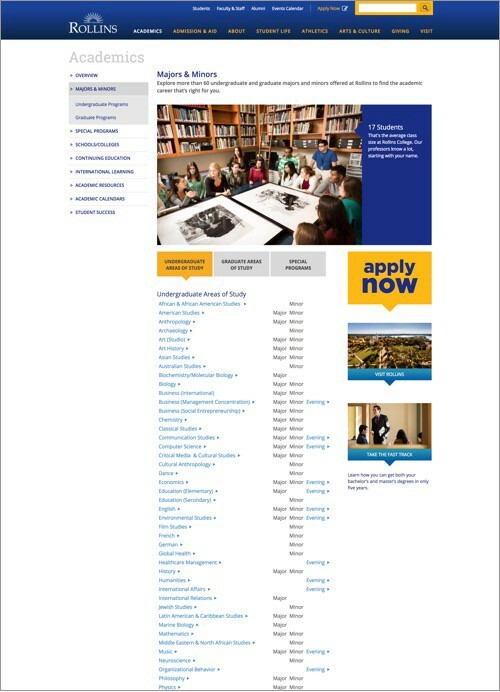 Can we reorganize the section’s structure to allow users to access Areas of Study more quickly? Research through competitive analysis is a crucial step in any redesign process. 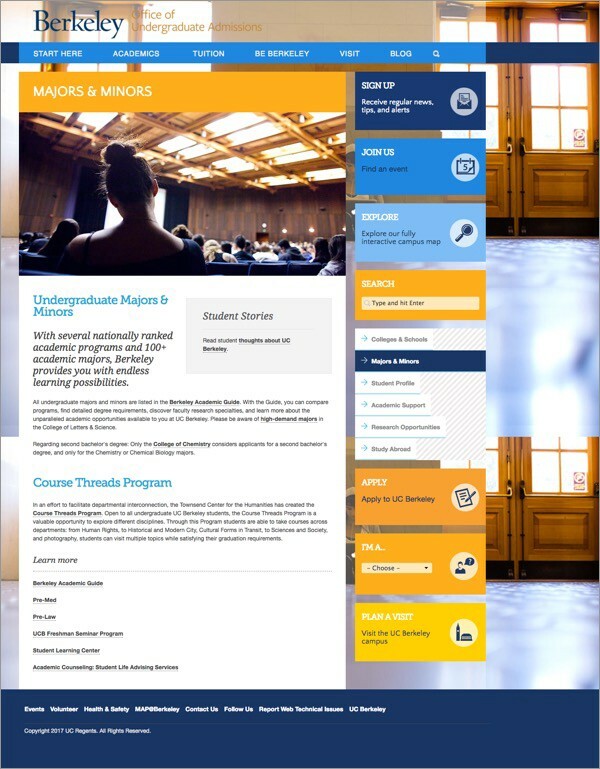 Examining various college websites allows my team to investigate how other institutions organize, present and label their academics information. 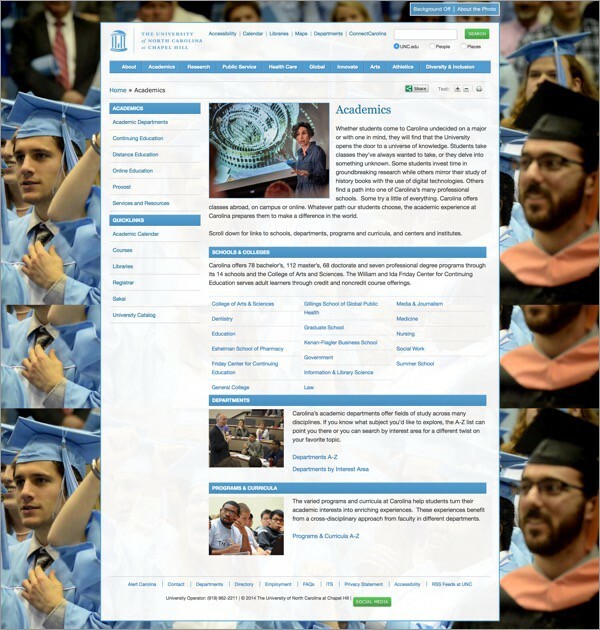 It’s an opportunity to question, how are other institutions allowing users to search for their academic programs? 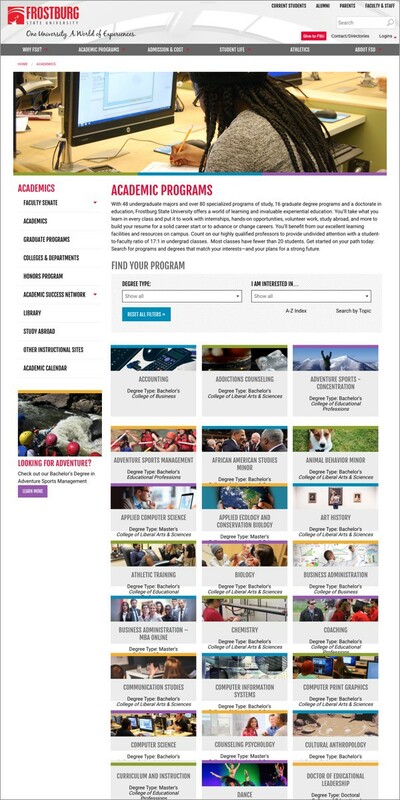 Are potential students looking for academics or areas of study? Which term makes the most sense for people outside of the industry? A few commonalities emerged as we surveyed several sites. 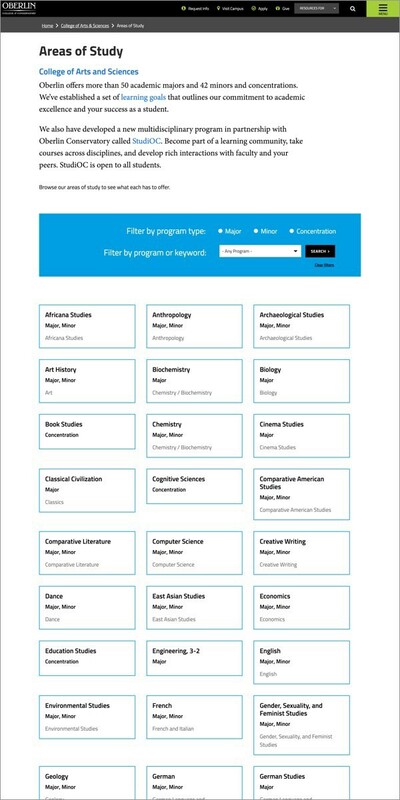 Some sites (screenshots below) combine the ability to search along with a list of available majors, or the ability to filter down the entries for quick viewing. One benefit we can assert from this is it puts more control with the audience letting them dictate what they’d like to view. 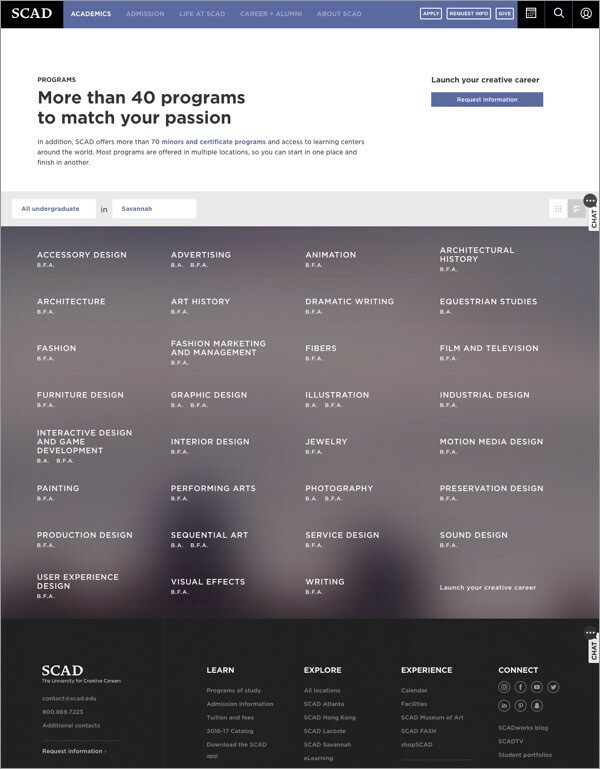 Savannah College of Art and Design, Berkeley, and Frostburg State University. Oberlin College and University of Nevada-Las Vegas. Towson University and University of Central Florida. 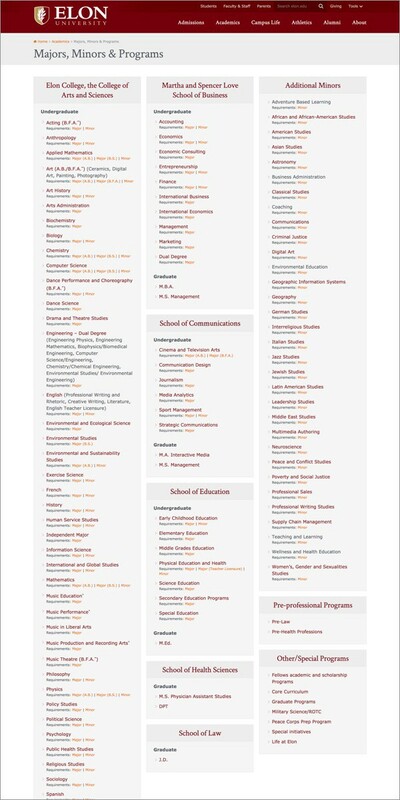 The pages below present the information as a broad list of all programs available at the college. The argument could be made that the benefit of this is that it allows you to see all of the options on one screen, especially if you aren’t sure what is offered or what you might be searching for. Maybe the best solution is a combination of both searching and filtering as well as lists? 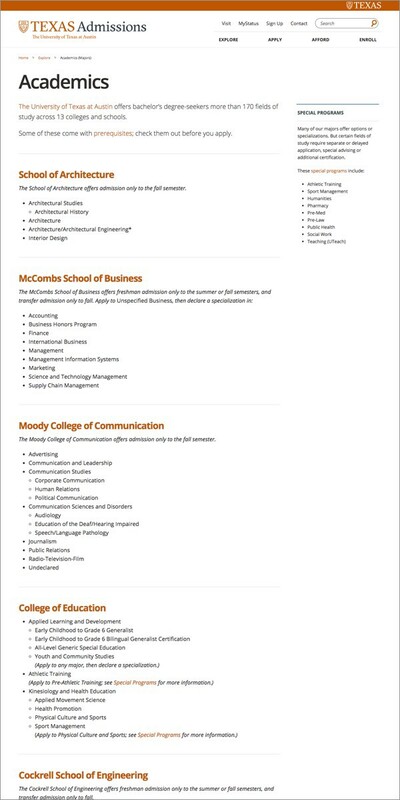 Based on the sites we examined, there does not appear to be a set standard for labeling this content specific to higher education. 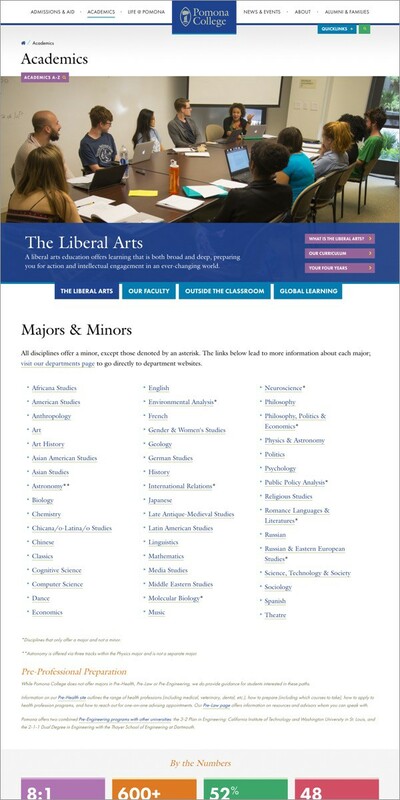 We found the terminology used most often for the main section header is Academics, which is then that is broken down into sub-sections labeled either Areas of Study or Majors/Minors. It will be beneficial for us to determine which of these terms resonates more with our users, so our site can be as effective and clear as possible. 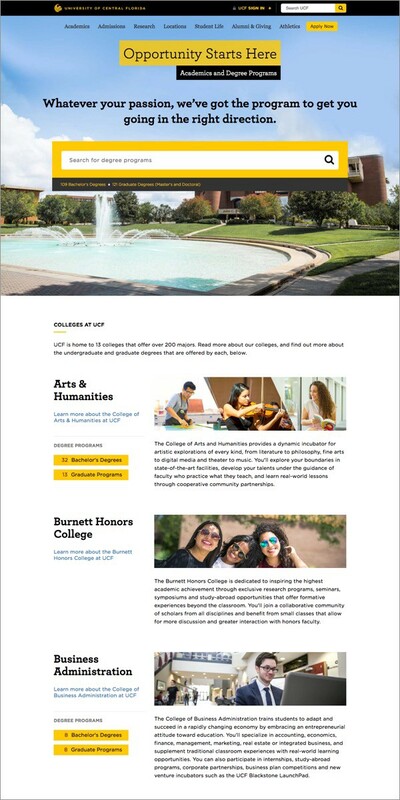 In light of this competitive analysis research, we’ll devise a scenario and conduct usability testing on our Rollins site as well as a few other colleges. We need to determine how people are searching for academic content, and the best way to provide it. 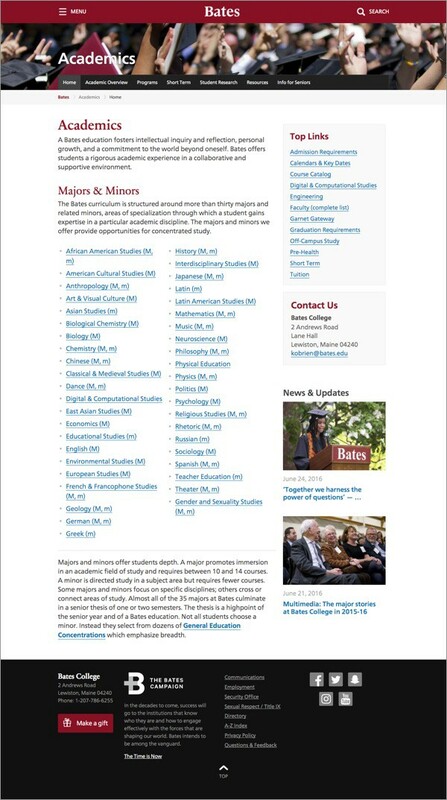 You can see based on the examples above that college sites are quite diverse on how they group and filter this information. 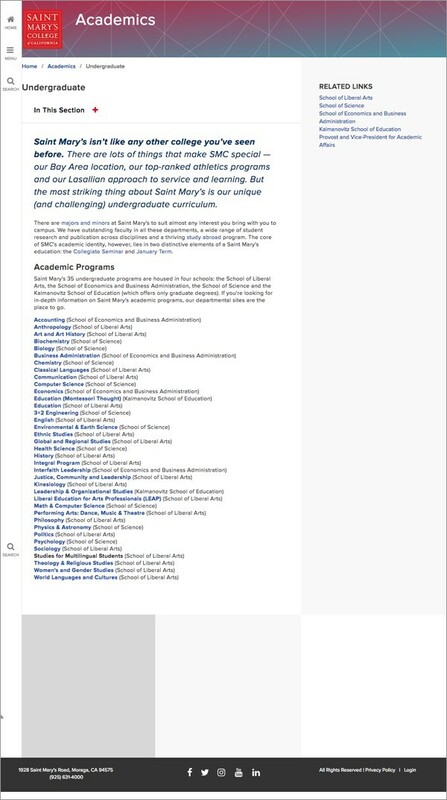 Do you know of any other schools that are doing this well, or have structured it in a different way? 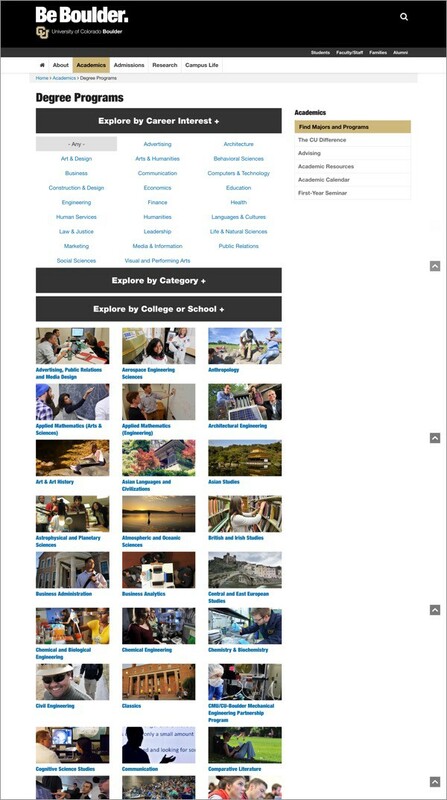 If the internet was a thing, what colleges did you investigate when you were prepping to go to college and how did you look for what programs, areas of study or academics were available? Did you easily find what you were looking for? Please comment below if you’d like to share any insight or answers to these questions above. Thank you for reading!